Shares in telecoms group BT fell 1.8% after it took a £225m charge related to its Italian accounting scandal. BT is paying the money to Deutsche Telekom and Orange to avoid legal action over the issue. The two firms now hold stakes in BT as part of the deal that saw them sell the EE mobile network to the UK company. 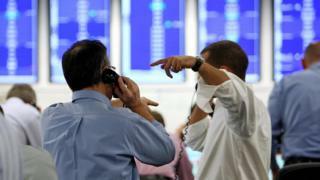 The FTSE 100 closed down 1% at 7,368.37. Main faller was British American Tobacco, down 6.8% after US proposals to cut cigarette nicotine. Second biggest faller was fellow cigarette producer Imperial Brands, down 3.79%. British Airways owner IAG had a turbulent day, and closed 0.08% lower. The airline group reported a strong rise in half-year profits, despite being hit by costs related to BA's computer failure in May. Barclays shares also went into reverse as investors digested its half-year results, dropping 1.68%. Costs related to the sale of part of its Africa business pushed it into a loss, but once these were stripped out pre-tax profits were up 13%. On the currency markets, the pound rose 0.1% against the dollar to $1.3076 and fell 0.2% against the euro to 1.1171 euros.